Granny Smith apples give a crunchy snap to these creamy chicken salad sandwiches for two. Serve them on whole wheat toast and share with a friend. Combine all ingredients except toast in medium bowl. 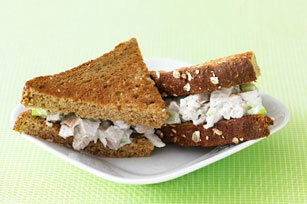 Fill toast slices with chicken mixture to make 2 sandwiches. For an extra kick, add 2 tsp. chopped seeded jalapeño pepper to chicken mixture.